Click icon to view Out of the Past clip. Michael Wigglesworth graduated from Harvard College in 1651, and was a fellow and tutor in the college from 1652 to 1654, as he continued his studies toward becoming a minister. Like many Puritan clergymen, Wigglesworth kept a diary for recording his daily life, meditations on faith, and his battles with lust and temptation. For Wigglesworth, however, these feelings took a form that seemed dangerous to record even in his private papers. Wigglesworth was plagued by his attraction to his male students, many of whom were his close contemporaries in age. The passages in his diary about these attractions are written in a secret code, allowing him to be explicit about his feelings and his fears. On April 5, 1653, Wigglesworth wrote, "I find my spirit so exceedingly carried with love, that I can't tell how to take up my rest in God." On July 4, 1653, he struggled with "filthy lust" inspired by "my fond affection for my students while in their presence." Wigglesworth married in 1655, but his attraction to men continued. The day after his marriage Wigglesworth confessed to his diary: "I feel stirrings and strongly of my former distemper even after the use of marriage --which makes me exceeding afraid." In 1656, Wigglesworth became minister of the church in Malden, Massachusetts. In 1662, Wigglesworth published an epic poem about the Last Judgment called The Day of Doom. The first 1800 copies sold out within a year, and the poem quickly became the most widely-read and frequently-memorized text of the age. Exerpts from the poem are often used in modern college courses to illustrate the grim and fiery tone of New England Puritanism in the 1600s. Wigglesworth's private torment, however, is seldom, if ever, mentioned in considerations of his work. Knowing Wigglesworth's private fears gives added resonance and pathos to the descriptions of the eternal torment of damnation in his writing. Whose flaming eyes hid things doth spy, and darkest things reveal." To fearful blame and endless shame are there most justly brought." No matter what Wigglesworth did to conceal his desires from his contemporaries, he felt sure that the truth would out, and damn him forever, when it really mattered. Wigglesworth's carefully encoded confessions were not revealed until the 1960s, when historian Edmund Morgan decoded the passages and published a full version of the diary. Wigglesworth seems to have taken his secret with him to the grave. However, a passing comment made by another minister upon his death reveals how important his decision to encode his thoughts had been. 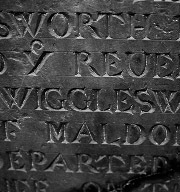 When Wigglesworth died in 1705, the son of one of his former students--the renowned minister Cotton Mather--preached the sermon at his funeral. In the published edition of the funeral sermon, Mather wrote that he could attest to Wigglesworth's great love and concern for his students, since he had read about it in the teacher's "reserved papers."